The AXA Research Fund, the Science Philantropy initiative of the AXA Group, supports the sharing of academic research on key societal challenges. 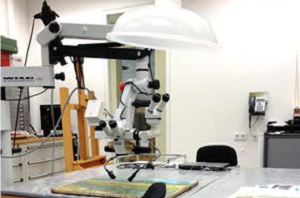 We are delighted that this year a grant has been awarded to Gauthier Patin for a research project at the Van Gogh Museum for helping the preservation of our art patrimony. Mr. Patin, you are analyzing the paintings of Vincent van Gogh, particularly the characteristics of the colours. He used oil colours just as other artists of his period did. What makes the application on his paintings so special? Van Gogh mostly used the same oil colours as his fellow artists in the late 19th century. However, he is one the rare artists for which his practice as painter is well documented through his letters and also intensively studied by conservation scientists and curators. The amount and the variety of information available allows to obtain a very good view of his artistic process. And this is what makes it so special about it. You are going to develop an Imaging Micro Fading Tester to assess the light fading risk on Van Gogh’s paintings. Can you explain the technical process you will apply? 1°) A powerful light generator that sends an intense light beam at the surface of the layer inducing a colour change of the surface. 2°) A spectrophotometer that monitors the colour change induced by the light beam. The Van Gogh Museum did some researches in the past to analyze the light fading that has already occurred on van Gogh’s paintings. What kind of effect will your tester bring? Indeed, the fading of Van Gogh’s paintings have been well studied. For example, we know which pigments are light sensitive. However, we lack information regarding the kinetic of the fading phenomenon. How long does it take for a colour to fade and how deep in the paint layer does the fading occur? We are hoping to bring some answers to these questions. Will these results of your project enable conservators of the museum to restore the colours on the paintings? The fading of colours is an irreversible process, once a colour has faded, it remains that way and there are no actual conservation treatments that can remedy to such degradation. However, I am hoping that the result of our project will help conservators to limit the light fading degradation in the future. Which kind of impact will the Imaging Fading Tester have on the art community? On the long term, our research will help conservators to preserve the artworks from light fading degradation or at least to minimize such phenomenon. 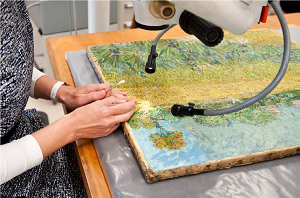 In other words, slowing down the fading processes, so that in 40 or 50 years visitors could still observe Van Gogh paintings in similar conditions as we do now. On a shorter term, we hope that the results from our study will enhance and facilitate digital colour reconstruction process. In default of looking at the real colours, digital reconstruction allows the visitor to have a better idea on how the paintings looked when Van Gogh painted them.